Typical brain infarcts are hypo intense on T1 and hyper intense on T2w images due to prolonged T1 and T2 values. 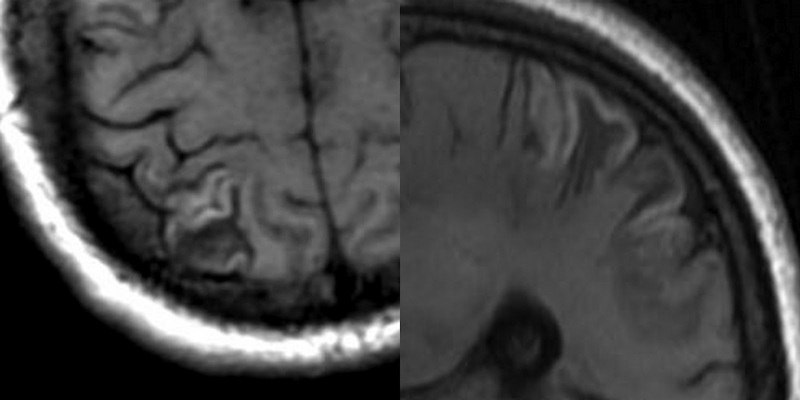 In some infarcts, faint high-intensity staining may be seen on T1w images in the region of cortical grey matter attributed to cortical laminar necrosis. The cortical laminar necrosis is first described by Swada et al. in a patient of anoxic encephalopathy. Depending upon severity of ischemia there are two types of ischemic injuries. 1st is Pan necrosis secondary to infarction, results from vascular occlusion involves all layers in the particular vascular territory. 2nd is Cortical laminar necrosis , an incomplete infarction where selective layers are involved due to selective vulnerability of cortical layers to ischemia, results from Hypoxia and Hypoperfusion. 1st T1 bright meth Hb staining in the region of cortical grey matter - a sub acute stage blood degradation product resulting from hyper perfusion in the region of infarct, which i personally feel convincing as in most of the cases i have seen low signal intensity staining on T2*GRE. 2nd Incomplete infarction resulting in selective neuronal loss followed by Glial cell proliferations and deposition of fat laden macrophages. 3rd Mineralisation in the region of cortical grey matter. The mineralisation is thought to be due to iron accumulation by surviving neurons and Glial cells giving rise to para magenetic effect and T1 shortening. These are T1w MRI images of a pt with bilateral cortical border zone infarcts secondary to hypotension as there is history of low blood pressure on admission. T1 bright staining is seen along cortical grey matter suggestive of Cortical Laminar Necrosis.